Zambia has begun trials of three herbal medicines to see if they can be used to treat HIV/Aids, it says. Twenty-five people with HIV will take part in the three-month trial, which the health minister said conforms to World Health Organization guidelines. 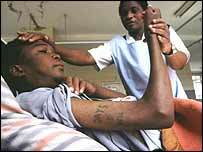 The United Nations estimates that one in six Zambians has HIV/Aids. An Aids charity spokesperson was sceptical about the trials, saying the only known effective treatment was anti-retroviral (ARV) drugs. At a press conference in the Zambian capital Lusaka, Health Minister Sylvia Masebo said: "It is a momentous occasion for Zambia which establishes a partnership between conventional medicine and traditional medicine." Dr Patrick Chikusu, principal investigator of clinical trials of traditional herbal remedies, said 14 natural remedies had been narrowed down to three to be submitted to the final stage of clinical trials. One of the three drugs is a formulation mixed by a former government minister and constitutional lawyer, Ludwig Sondashi. The cost of ARV drugs, which have been shown to be effective in suppressing the effects of the virus in the West, are too expensive for most people in developing countries to afford. Genevieve Clark, of the British charity Terence Higgins Trust, said: "I can understand why people are desperate to find anything that helps." "Anything that boosts the immune system helps... Anything you can do in terms of eating healthily and being healthy is to be welcomed." But she added: "Herbal remedies have not been proven to help... The only thing proven is anti-retroviral treatments." She also expressed concern that the test sample of 25 people was not large enough to be a "proper clinical trial".